As quoted by Bernard Marr – “Artificial Intelligence is the broader concept of machines being able to carry out tasks in a way that we would consider ‘smart’.” AI is nothing but intelligence manifested by machines. And ‘chatbot’ is an exemplary example of AI. It is an AI based chat option. Chatbot is designed to respond to the user request. Instead of a stereotypical chat help, this advanced technology helps to build a casual chat session with a purpose to serve. Using chat interface, chatbot is a tool that interprets a typed or a spoken message and responds accordingly. Why chatbot is a must adapt feature? Facebook Messenger, which now boasts 900 million monthly active users have already implemented more than 11,000 bots to help improve customer service. Why is a chabot development essential element? Chatbot user experience is ultra fast and simple. No sign in or sign up process like an app or a website. A standard UI based solution. How can Chatbot development and GPS perform magic? 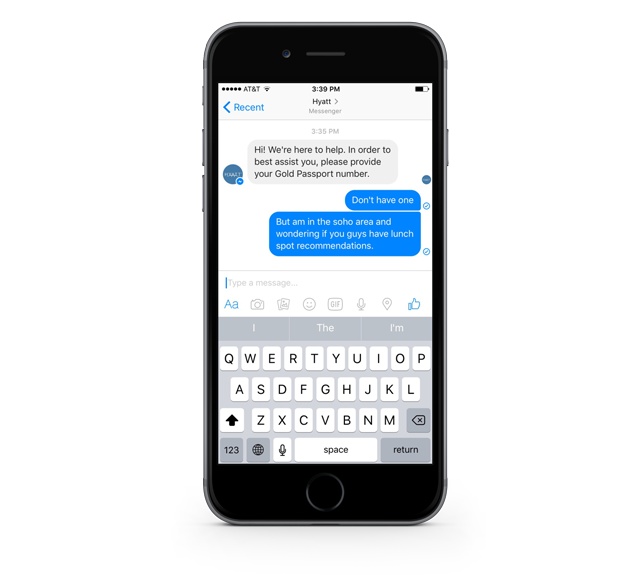 An American multinational hotel operator Hyatt, has very wisely embedded its chatbot with the messenger to give its customers a unique and interactive experience. For hospitality industry in most, building long-term personal relationships with its guests is essential. Chatbot development enables a user-friendly experience of having an informal communication. This leads to the success stories of customer retention. With GPS enabled and Chatbot development, you can allow the user to find a nearby hotel. If the user wants to find out if there are any events nearby, just one message to chatbot and the information will be handy. If the user wants to explore the menu of any restaurant nearby or the parking space and more, chatbot always will be a helping hand. What can your hotel app along with a bot and GPS do? If you are into the hospitality industry, you should definitely not think twice about investing in an mobile application. Moreover, it would be an enhancement to get along with an app. You can provide worth-another-visit experience to your customers and get a brand value for yourself. Information: display information on the user request. For example, if a user wants information on tariffs, you can provide them as requested. Recommendation: You can recommend your users any offer to avail in a restaurant or hotel or any particular dish that your restaurant is specialized in serving. Booking: Ask the user for stay dates and display room options. Also, set actions like ‘Book Now’. With a bot you can give your users a refreshing customer service experience. Instead of waiting for their turn on call or waiting for their emails regarding a query to be responded, chatbot can help you guide them in real-time. LetsNurture has a wide range of solutions to foster your technological requirements. From mobile apps to websites and chatbots, we promise to deliver the best. With our skilled developers, we can guide you throughout the project. If you are a business, looking for innovative solutions for app or chatbot development, please feel free to contact us. Send us your queries at info@letsnurture.com.